A lot of patients want to pre-plan gifts for labor and delivery nurses. 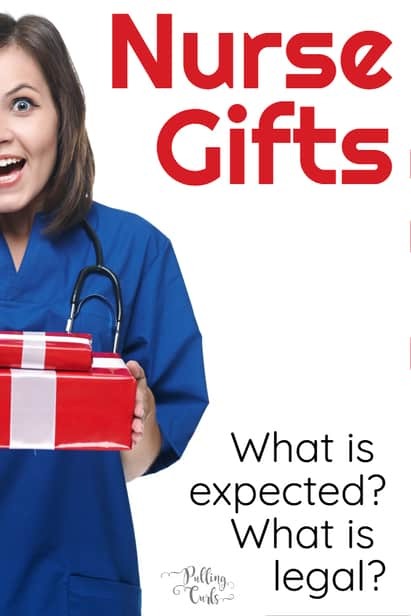 This post, from an L&D nurse, and will tell what gifts for nurses are expected. What does your labor nurse think of your birth plan? Price? who’s going to tip 20% of your delivery bill? Umm… no one. Sometimes you can’t actually put a price on our services. The nurses really don’t expect anything — you won’t find tipping envelopes in your bathroom. And perhaps, most of all — tipping healthcare staff is actually not legal — at least not for the nurses to accept (with some exceptions). So, how do I know all of this? Hi, I’m Hilary — I’m an L&D nurse and have been since 2001. I love my job and I love my patients, and let me equivocally say that I very rarely get a gift. And that, is OK. I am 100% not in it for the gifts. Pro Tip: The best gift you can give your nurse is a bit of positive education. Know the basics of what will go on and what to expect — she’ll love that you took the time to prepare! Why is tipping healthcare staff illegal? Well, a tip is meant for exceptional service –right? BUT, in health care, we really should be giving exceptional service to EVERYONE. Most of all, I shouldn’t only give exceptional service to someone who looks rich and may tip me better than the homeless woman down the hall. I am a big believer in this. I rarely look at people’s insurance. Once women are in gowns it’s often not as apparent who has money and who doesn’t — and I want to love and serve each of them the same. Now, be rude to me or condescending, and that’s another story…. SO — you trying to tip me, that’s not illegal. BUT, me taking it, that IS illegal. I’m not saying that they can throw me in jail — but I can say that the hospital can get in trouble and I would likely lose my job. In the healthcare ethics classes I have gone to for my work, they have made it VERY clear that tipping is NOT OK — for the reasons mentioned above. Also, because people who are paid through government dollars (aka, medicare/Medicaid) are not able to take tips. Now, I have had one exception and that is the red envelope. Asian families will prepare envelopes of thanks in advance for those who participate in the bringing into the world the new baby. By not taking the envelope it is VERY Rude. So, as long as the envelope had less than $5 we were able to keep it. **Some hospitals are more/less lax on this — so you may want to check with your nurse if you’d like to give her something really nice. But, officially — gifts JUST for us with more than $10-15 in value are a big no-no. What nurses can accept for gifts? We are able to accept products. But, at a low dollar amount. I am not sure the dollar amount, but it’s low maybe $5. If you bring me a lotion or a cookie — I can take that. But, officially, we shouldn’t take gift cards or cash for any reason (although I have seen managers turn the other way when a patient is very generous). We are also able to accept larger valued products for the whole unit. A tray of cookies, lunch for everyone. Things like that. Food. Food is always welcome. If you’re going out for dinner, maybe ask her what she’d like and bring her back some. I ALWAYS appreciate this, even if I sometimes turn it down. It’s very thoughtful, and not a lot of extra work for you/your family. Baked goods for the staff. While you may just see one nurse, there is a crew of people behind her that is also helping out. Techs, secretaries, housekeeping, doctors, managers, etc. By bringing a tray of baked goods, everyone can share. Remember that you will have both delivery nurses and postpartum nurses. Those are separate areas, so sometimes two trays is extra nice. Lotion — our hands get SUPER dry as we wash when we’re in the room or sanitize, each and every time we’re in your room. I thought this set was pretty cool, and still under the dollar amount (and you could give one to each of your nurses). A Card — a gift certainly doesn’t need to be big to be meaningful. I once had a bad delivery and the woman’s mom sent me the nicest card about how she’d always remember what I did to save her grandchild. I still have it. Gives me many warm fuzzies. All of these can be brought when you deliver, or afterward. We have patients do it both ways. Some people keep the gifts in their room and offer them as staff come in, and some people take them to the nurse’s station (although, if I had my choice I’d say to take them to the nurse’s station as I am often busy when I’m in your room and later feel awkward about asking about it). 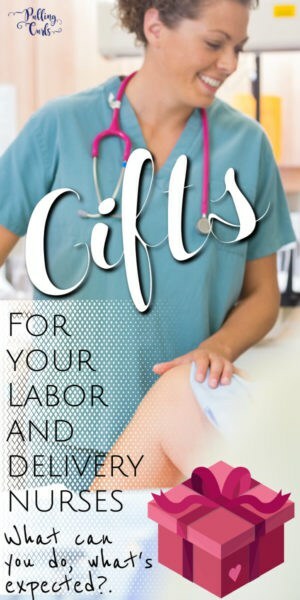 How many gifts for labor and delivery nurses? Bring a couple of small goodie bags for nurses you really liked in labor or postpartum. Just bring one larger gift for everyone in the department. Even though you just have one nurse, there are many people behind the scenes supporting you. Bring the gifts by after you deliver — even if they’re not on shift, they’ll hold the gifts for them. I hope you enjoyed this post that talked about gift baskets for L&D nurses. 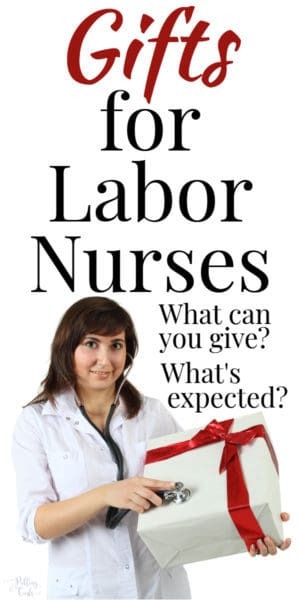 Of course, their favorite is a thank you note to labor and delivery nurses. I hope you figured out how many nurse gifts do I did, and have some ideas for labor and delivery thank you tags. And of course, this post answers the age-old question as to why are labor and delivery nurses mean (answer, we’re holding our bladder). Never feel bad you don’t have a gift. You can always bring something later (and if you get caught-up in new-mommy-hood, that’s fine too). I was JUST thinking about this since I just had a baby. My nurses were all so amazing. I’m glad to know what I can and cannot get them! You’re welcome. hope things are going well with the baby! These are great ideas, I’m always a bit lost when it comes to this subject – but not anymore!